We just published SMB Group’s 2014 SMB Mobile Solutions Study. The survey, which is our fourth annual study in this area, reveals many interesting findings about how U.S. SMBs are using mobile solutions in their businesses. SMB median spending on mobile technology and solutions as a percentage of total technology spending is up from roughly 12% in 2013 to 16% in 2014. The study also shows that mobile applications are becoming more important to SMBs, not only as a complement to traditional business applications, but even as a replacement in some areas. For instance, mobile access has become the preferred interface for collaboration social media apps for a significant percentage of SMBs. Furthermore, adoption of bring your own device (BYOD) continues to rise: 59% of SMBs with 10 to 999 employees now support BYOD. 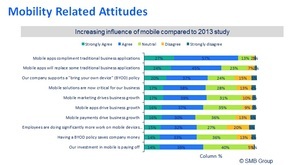 The top driver for BYOD is that employees prefer to use their own, familiar devices. However, among the 41% not supporting BYOD, security and management challenges are top impediments to adoption. As reliance on mobile solutions increases, SMBs have a growing number of mobile apps and more diverse mobile devices to manage. Consequently, adoption of mobile management solutions is rising as well. Currently, 45% of SMBs with 10-999 employees use mobile device management solutions, and 36% use solutions to manage mobile applications. Segmentation by industry, business outlook, technology spending, etc. For more information and pricing for complete study results or for a focused segment, please see the study brochure. For a detailed table of contents, send and email to lisa.lincoln70@smb-gr.com or 508.734.5658. I love all the statistics shared in this Blog. Great Job! !